Sheffield United are investigating allegations of "inappropriate" behaviour by fans during Monday's home game against Bradford City. Supporters of the Bantams reported racist chanting by a small number of Blades fans. 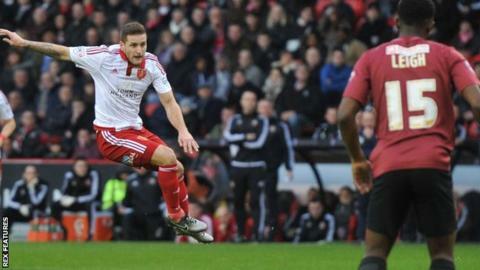 Meanwhile, United striker Billy Sharp complained about coins being thrown at him from the away end. "The Blades will take every step to track down and deal with those responsible," said a club statement. "The club has received complaints about both sets of fans from the fixture - including a number of contradictory reports. "Sheffield United is an inclusive family and community orientated club where everyone is made to feel welcome and it endeavours to improve on this principle year on year." Sharp scored the opening goal as the Blades won the game 3-1, but afterwards said "Cheers Bradford for the coins" as part of a post on Twitter.